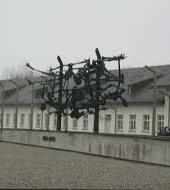 This tour will lead you through the city of Dachau and to the former concentration camp. Driving through the village of Dachau, we reach the former concentration camp. You’ll have time to see the memorial site, the museum, and the documentary film. Explanations of the memorial site will be given on the bus. There will be no guided tour on site. Visitors are asked to respect the dignity of the site by wearing appropriate attire.